In late April 2017 I had the privilege of attending and presenting at a workshop at McMaster University titled “Undiplomatic History: Rethinking Canada in the World.” Organized by Asa McKercher and Phil Van Huizen, this gathering brought together scholars working on various types of “new” Canadian international history that often get overlooked by traditional diplomatic history, with the intention of turning the papers into an edited book. My contribution was a sort of a reconnaissance of modern Canada-US environmental diplomacy to show that much, even most, of Canada’s relationship with the United States is predicated on the environment. Put another way, because of the shared border, Canadian-American relations is largely based on trading, sharing, exploiting, and governing natural resources. East Block of Canadian Parliament, where the Department of External Affairs was located for many decades. Despite its obvious importance, environmental diplomacy has been a consistently ignored aspect of northern North American relations (confirmed by the exclusion of environmental considerations from some recent historiographical surveys of scholarship on the history of Canadian foreign policy). I was a scholar of Canadian international relations before I was even an environmental historian – indeed, an interest in Canadian transborder relations with its southern neighbour is what helped lead me to the environmental history field. Thus, when I critique the oversights of Canadian diplomatic history, as I do here, I do it as someone who emerged out of that discipline, not an outsider who just wants to see their particular field better represented. Definitions and disciplinary turf wars are, I suggest, part of the reason that the joining of environmental and international history is still a rather underdeveloped field: e.g., non-historians have been producing most of the work on “environmental diplomacy”. But it’s also because Canadian foreign policy scholarship is too parochial, concerned with the history of “dead white men,” and focused on rehashing big international relations and security questions in which Canada plays a negligible or minor role … while ignoring the natural resources sectors where Canada is often a major player, for better or for worse. In the last decade, Canadian foreign policy scholars have thankfully been much more attuned to contributions from transnatinonalism, borderlands, immigration, and migration scholars. In other words, they have been open to the ways that humans move across borders – but rarely have they been attuned to the ways that nature does the same. True, North American diplomatic historians have addressed certain natural resources because of their economic, political, strategic, and military importance – oil is an obvious example, while fish, water bodies, and birds have been the subjects of treaties brokered between Ottawa and Washington. But, with a few exceptions, international historians generally treat these natural resources as passive, one-dimensional objects bereft of any materiality or agency, just statistics on paper, no different than widgets or chocolate bars. An environmental history perspective would insist that the nature of these natural resources – whether it be smelter smoke or zebra mussels, red fife wheat or bauxite – makes an enormous difference. This requires looking at the ways that society and the natural world have mutually shaped each other by drawing on sources and approaches (e.g., ecology, science, technology) that foreign affairs historians might find, forgive the pun, foreign. Nature needs to taken seriously as something with historical causation and agency, which is a foundational tenet of environmental history as a discipline. Moreover, in addition to examining how nature is a historical actor, diplomatic historians haven’t acknowledged near enough that the Canadian-American relationship has major environmental repercussions: uranium for nuclear weapons, tar sands, aluminum production, and on and on. By way of illustration, let’s hop back to the beginning of Canada as a formal political entity. Many of the dominion’s major diplomatic forays after becoming a nation in 1867 concerned the environment: formal fish agreements were central to early Canadian-American relations, for example. By the early twentieth century, some of the first Canadian-American treaties concerned other forms of wildlife conservation, such as migratory birds and seals. The Boundary Waters Treaty of 1909 outlined methods of governance for changes to border waters and also created the International Joint Commission (incidentally, I’m co-editing a book on the history of the BWT and IJC, and we will hold a workshop in September 2017). 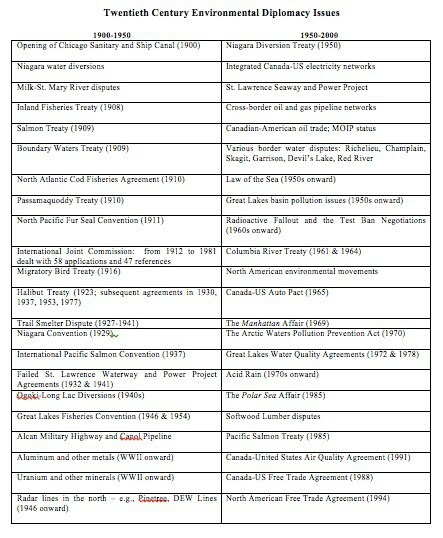 The sheer magnitude of this list alone indicates, I hope, the historical importance of environmental diplomacy issues within the northern North American relationship during the twentieth century. Moreover, reading between the lines of this list it becomes apparent that the accumulation and development of these various types of natural resources was usually the result of settler colonialism tactics that pushed native groups out of the way. To try to bring some qualitative detail to that quantitative list, in my workshop contribution I used three water case studies from the first two decades of the Cold War: the Niagara River Diversion Treaty of 1950, the St. Lawrence Seaway and Power Project of the 1950s, and the Columbia River development of the 1960s. All three were punctuated issues – i.e., big-ticket affairs from the perspectives of diplomats and political leaders – and front page news. Once completed, these water developments became the infrastructure that facilities the smooth flow of transborder relations. In that sense, the general tenor of the bilateral relationship is predicated just as much on the continuing day-to-day, often low-profile, matters. And it should be added that until the 1960s Canada-US energy relations was dominated by hydro-electricity exports for projects such as these, not fossil fuels. Including an environmental perspective not only opens up the aperture to bring new subjects into the frame of international history but, just as importantly, it changes the depth of field of, well, the field by bringing into focus important environmental aspects of the issues that have traditionally concerned Canadian foreign policy scholars. Consider issues that always make it into survey histories of Can-Am relations, but whose environmental dimensions are often unrecognized. Think about the environmental toll of producing vehicles under the 1965 Canada-US Auto Pact, for example. Moreover, the field of international history would benefit from adopting environmental history methods because the greatest international threats currently facing humanity are arguably ecological – or “natural security” – issues: climate change of course, but also pollution, water scarcity, health pandemics, sea level rise, energy sources, etc. But it also isn’t a one-way street on which only international historians would benefit from environmental history; there are plenty of ways that environmental historians could, and should, engage insights, methods, and questions of concern to foreign policy scholars. For example, the turn in global environmental history is an obvious avenue, to press the road anaologies a bit further, for convergence. Ultimately, I’m not suggesting that environmental diplomacy alone can explain the whole Canadian-American relationship. But I would suggest that the inverse is equally true: exploring the Canadian-American dyad without cognizance of and emphasis on environmental diplomacy fails to provide a sufficient picture of the bilateral relationship. On these subjects, see one of the few works on Canada-US environmental diplomacy by a historian: Kurk Dorsey, The Dawn of Conservation Diplomacy: US-Canadian Wildlife Protection Treaties in the Progressive Era (Seattle, WA: University of Washington Press, 1998).